Exquisite in taste and melting in the mouth our Swiss Chocolate Roulettes offers a wide range of applications: flower decorations for cakes or other desserts or just for fun. 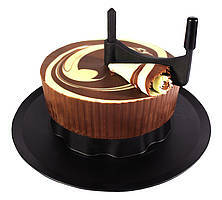 Turn the slicer and make your own fan-shaped chocolate decoration. Try it - it’s easy! Click here to learn about how to use our Swiss Chocolate Roulette Set.